Spire SPg7 Credit Card PDQ Rolls (50 Roll Box) with " Free Next Day Delivery Ireland ". Discount Till Rolls only use "Epson / NCR / IBM / AXIOHM Approved Paper" to make our Spire SPg7 Credit Card Rolls. By using only OEM approved credit card rolls you will protect the print heads on your printer from damage. Replacing print heads on your credit card terminal can be nearly as expensive as buying a new machine. 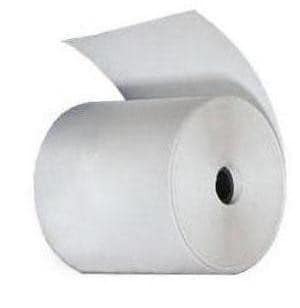 Cheaper Credit Card Rolls will wear out the print heads faster and will leave dust to clog up your printer and damage your print heads and printer sensors. Also the printed receipts can fade in a short period of time that you can no longer read them. In these cases cheaper is not always better the only answer is, Low Cost High Quality Spire SPg7 Credit Card Rolls from Discount Till Rolls, look for branding TillRolls.ie on back of roll to be sure of high quality paper. 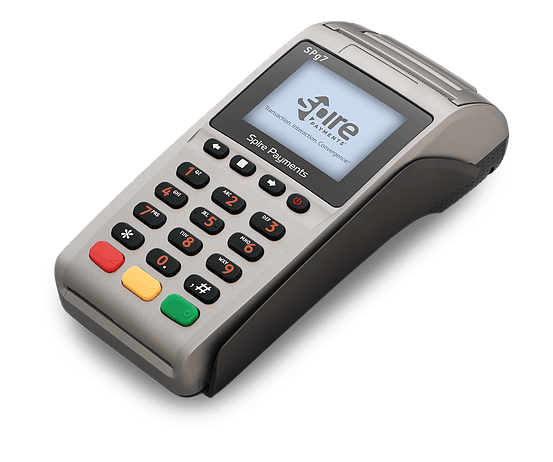 If you are not sure which Spire Credit Card Rolls you need, or Ph: +353 (0)1 4433964 UK Local Ph: +44 (0)20 8144 4475 and we will be more than happy to help you find what you require. This page contains credit card rolls suitable for use in the Spire SPg7 credit card terminal, and a picture of the Spire SPg7 in order to help you identify your machine. Products listed are not manufactured or endorsed by Hypercom and the terms Spire and Spire SPg7 are used for identification purposes.